Welcome back to day nine in our 10 day series of free & frugal homeschooling! If this is your first time here, or you’d like to review, begin the entire series here. I shared the other day the events that brought about our sudden jump into our $50 homeschool year. It was one of those times of great faith for our family. There are many ways the Lord provided when my husband lost his job. We had radical things happen like opening a letter that contained several hundred-dollar bills. Or, how we were 4-months behind in our house payment, praying off foreclosure, and our tax return was (now READ this), our tax return was to. the. penny. what we owed the mortgage company. That is the Lord’s provision. During this time I did return to work part-time on the weekends for 3-months. You have to know that under normal circumstances this would have been agonizing for me, and yes it was a fear I had at the beginning of this test. However, one day I had complete peace (and I’m really big into following peace as my guide) about calling a friend of mine who was HR manager for a local medical facility. In that one call I had the part-time position that I needed. This too was a miracle because in our area nurses were actually being laid off. During those weekends my husband watched the children, and during those weekends I had many patients and co-workers touched by the Jesus in me. It was truly a time of seeing His handiwork amplified. For our homeschool that year we focused heavily on reading great books. We’d already discovered that reading together and a loud was one of our favorite family activities, but during the lay-off year we took it to a new level. The Lord also prepared me right before this season of extreme frugal by guiding me to read the (affiliate link) The Three R’s by Dr. Ruth Beechick. This book reinforced a gentle focus on math, reading and language. With the practical instructions laid out in The Three R’s I felt I could go a long way in teaching my children without a full curriculum. I also found during that year that all I really needed is the Bible, and if at all possible the library and internet. It was also during this year that we started lapbooking. The first lapbook that we ever created was the 17th Century Lapbook, which I got for free when I signed up for A Journey Through Learning’s newsletter (This offer is still valid too.) After we got our feet wet with the 17th Century Lapbook, I found Homeschool Share and started setting our printer on fire while printing off their free lapbooks and unit studies. I also started using the great sites like Notebookingpages.com And finally I took the jump and started designing our own lapbooks and unit studies, like our Where the Red Fern Grows lapbook and unit. Here you can read more about how we create literature lapbooks in our homeschool. Most importantly during our $50 homeschool year I learned that the Holy Spirit is directing my steps and the steps of my children. All the things (and this lesson can go beyond homeschool “things”) that I thought we wanted and needed, we didn’t. The curriculum that I thought I couldn’t live without; we did just fine without it. I had to trust the Lord to give us what He wanted us to have. We ended up with a school year that will surely go down in our family homeschool history as one of the best years of learning that we’ve ever had. It’s in these faith places where the Lord shows Himself strong. It really is the simple joys that matter. 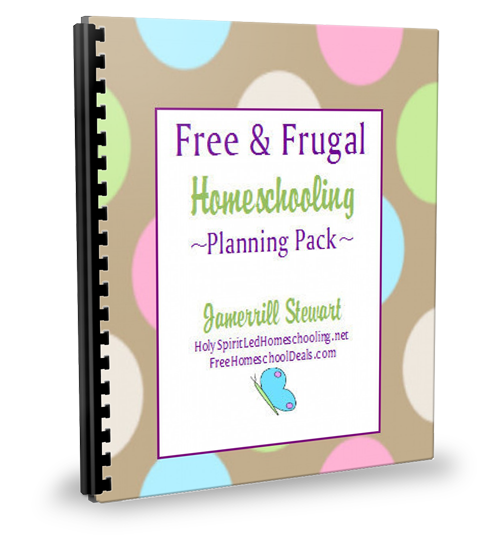 you can download the Free & Frugal Homeschooling Planning Pack. Download the Free & Frugal Planning Pack here! Welcome back to day three in our 10 day series of free & frugal homeschooling! I’m sharing the first part of our family story about our $50 homeschool year; which sparked our journey into homeschooling on the cheap. Our first few years of homeschooling I dropped several hundred dollars per year on curriculum that I really didn’t like; all for one child. I wasn’t sure what we needed, or just how to do this homeschooling thing. For many of us, this is a starting point. Oh, but there is homeschool life beyond those cloudy beginnings. We tend to find our pace and learn, mostly through good old trial and error, what works for our family. Some of us (raising my hand) tend to learn best in trials. Having several hot financial seasons in the fiery furnace while homeschooling brought me to our free & frugal homeschool life. Of course if I had to give our homeschooling style a name it would be Holy Spirit-led. Naomi, Zion, and Jadin observing a monarch butterfly that we hatched in homeschool. God made our children, and He preordained us to be their parents. Whatever our children need: the Lord will provide. Whatever their destinies: the Holy Spirit will guide them. Jesus is the author and finisher of our homeschool. He has to show up everyday for this to work. This Holy Spirit-led Homeschooling goes hand in hand with homeschooling for free & frugal. Faithschooling and freeschooling are a casting of my need to control and feel as though I’m living by my plan. I do my part in planning (with pencil) what our children need. I work my resources thoroughly. I focus on training our children in the way that they should go; I trust the Lord for the rest. I know that can be easier said than done. There are families who want to homeschool; however, finances are holding them back. That’s an uncertain place to be, in that faith place. I remember the morning that my husband came home from work early. About 6-months prior to this he had lost his cushy government contract with Homeland Security. With that job we traveled the east coast for free as a family for a year, living in Marriott Residence Inns (it was a blast! ); during our full-time travel year the Lord confirmed that I needed to lay down my nursing career and stay home full-time. Where did I find myself after stepping out in faith and quitting my job? I was standing in my kitchen with four small homeschooled faces looking at me and a husband who walked in the door 5-hours too early. I’ll have to go back to work. *In this series I’ll share more of our lessons from our $50 Homeschool Year that changed the course of the way we home educate our children. For now I have 3 goodies for you. Don’t forget to enter the Spring Blessing Giveaway for your chance to win $360 in paypal cash! This month I’m offering a limited-time freebie for ‘likers” of my Facebook community! I don’t always share broken pieces. But I’ve been broken nonetheless. I know that the Lord will use the ugly parts to bring glory to His Name. He has always been my daddy and the lifter of my head. Today I’m sharing about my father’s alcoholism and suicide on The Better Mom. Please join me there for Share Your Broken Story. I’ve had sweet conversations lately with moms who are trying to figure out a cleaning schedule for when they “officially” start homeschooling. This naturally leads to questions of how I find time to clean my house and homeschool; especially after my post about Age Specific Chore List for Children Ages 1-12. We aren’t slaves to our home; but caring for our house is something we’ve always done as a family. I believe that children should be trained in responsibilities (chores included) from the get-go. For our first years of homeschooling we cleaned in the mornings after breakfast. This worked just fine when I only had 2 or 3 smallish children. We were blessed with two more sweet little boys in under two years. You can see in our homeschool life schedule we now have an hour in the afternoons for focused cleaning. I read several posts last year, inspired by Kim Brenneman’s book Large Family Logistics, that encouraged afternoon cleaning. It sounded crazy to me at first, but we gave it try. For our family it has worked fantastic. Since we’ve moved our heavy cleaning to the afternoons we’re able to start homeschool after breakfast and devotions, when our energy is fresh. We usually have our family school work time completed by lunchtime. This affords us several hours for our read aloud time, projects, or independent learning. I created a daily family cleaning schedule after switching to an afternoon cleaning time last year. Before you look at it, let me add there are also days where we romp with friends in the sunshine, or roadschooling to various places. And we certainly have seasons where our homeschool goes on survival mode, or I honestly don’t know where to begin. In those times we do what we can do. We put one foot in-front of the other. And we sing “just keep swimming” with Dori from Finding Nemo. Here is the download of our Daily Family Cleaning Schedule, if you’d like to look at it closer. You’ll notice that each member of our family has a daily Responsibility Focus of a particular task. The three tasks that need attention several times a day are: Sweeping (all hardwood floors here, no carpet), Dishes (the old-fashioned way, no dishwasher), and Pick ups (you know, the toys and LIFE that accumulate because we LIVE here). The Responsibility Focus for each day is rotated. That way no one feels stuck with the same jobs everyday. It also allows for each family member to be cross trained in running the details of our home. Beside each day of the week name, each family member has assigned responsibilities for our afternoon family cleaning time. You’ll notice that Naomi is helping me for most duties. This gives us a little “girl time,” and I’m training her in chores. Once she’s more independent, Gabriel will be ready to learn more responsibilities and spend his cleaning time learning with mommy. Keeping a Clean House While Homeschooling: Includes a great chore chart idea from Kris at WUHS. The Case for Once-a-Month Cleaning at Simple Homeschool. The One Day Home Blessing: Focusing on doing the major cleaning chores one day per week by Amy at Raising Arrows. Every Room in the House is a Mess: Here is a survival plan from Large Family Logistics on how to get your house together when every room is a mess. Taming the Tornado: MANY organizing ideas and helps by my buddy Jenn at Daze of Adventure. 31 Baby Steps: Takes you through 31-days to building healthy cleaning habits, thank you Fly Lady. Healthy House-keeping Habits: Hodge Podge offers service opportunities, jurisdictions, tossing laundry, etc. Laundry Routine: Creating a Weekly Laundry Plan Lauren from Mama’s Laundry Talk helps us find a plan. Laundry Routine: Stay-at-home Moms Mama’s Laundry Talk strikes again for another fabulous laundry idea. Kids and Chores Christine from Fruit in Season shares how chores work for her kids. Priorities for Scheduling Your Week Rachel of Finding Joy always has photos, words, and ideas of beauty. Creating a Cleaning Schedule: Ideas for creating a custom daily, weekly, monthly and seasonal schedule that works for you. Cleaning Shortcuts, Speed Secrets, and Quick Cleanups: Includes cleaning shortcuts and 15-minute pick up ideas. Getting it Done: 10 Tips to Cleaning Your Home While Homeschooling from The Homeschool Classroom. Great tips! Tell us what your cleaning schedule is for your home. What works well and what would you like to change? If you have a post on cleaning, de-cluttering or organizing that you’d like to share, please link it in the comments below!